Cormorants nesting? New Zealand fur seals snoozing on a dock? A group of gannets? 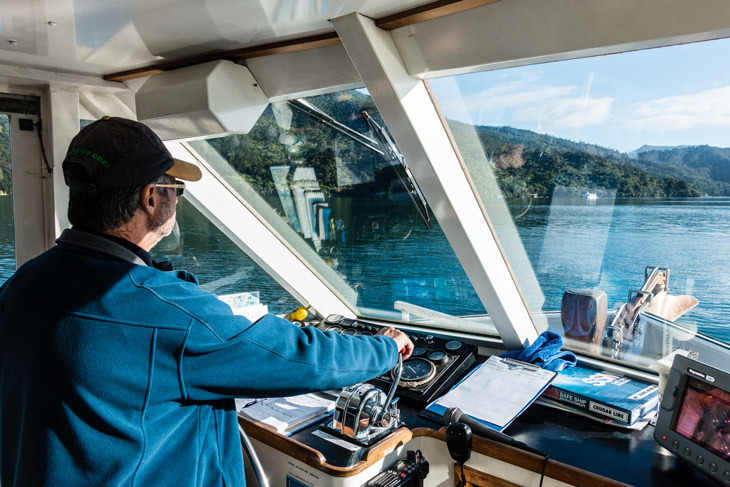 Captain Bill slowed the motor launch so that we could see and learn, as we made our way into Queen Charlotte Sound, past Wedge Point, and on to Mistletoe Bay. When we disembarked, guides Jill, Linda, and Wendy led small groups on a two-hour “quiet dawdle” along the Queen Charlotte Track. 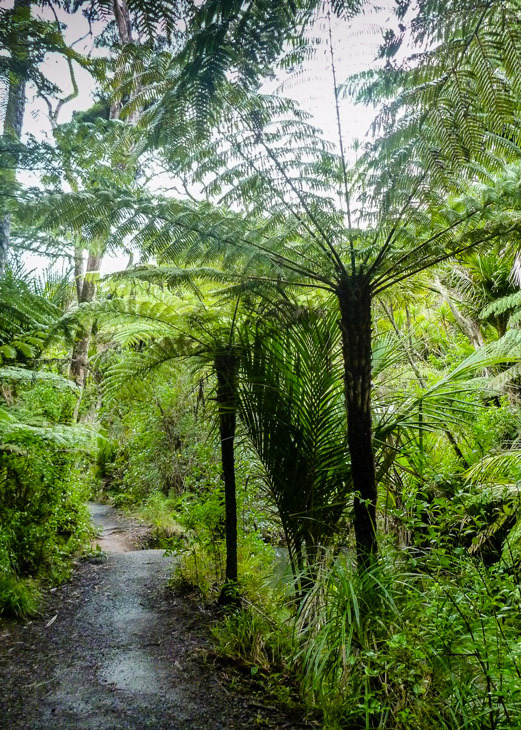 New Zealand is a country of ferns, with more than eighty species. The ponga (silver tree fern) is the New Zealand logo; you may have seen it on All-Blacks merchandise. There’s even a movement to change the national flag to display the tree fern feather. New Zealand is also a country of birds. “Australia’s birds have flashier colours, but New Zealand birds have prettier songs,” says Jill. The tui and the bell bird have beautiful songs, and we were lucky to see and hear each of these birds, who are clever enough to imitate human speech and each other. A friendly fantail, towering rima trees, and delicate orchids were other highlights of our guided walk. Picton might be New Zealand’s prettiest, friendliest seaside town. Captain James Cook found shelter here during his voyages in the 1770s. In fact, Cook spent more time in Picton’s sheltered harbour than anywhere else on Earth, other than his home. 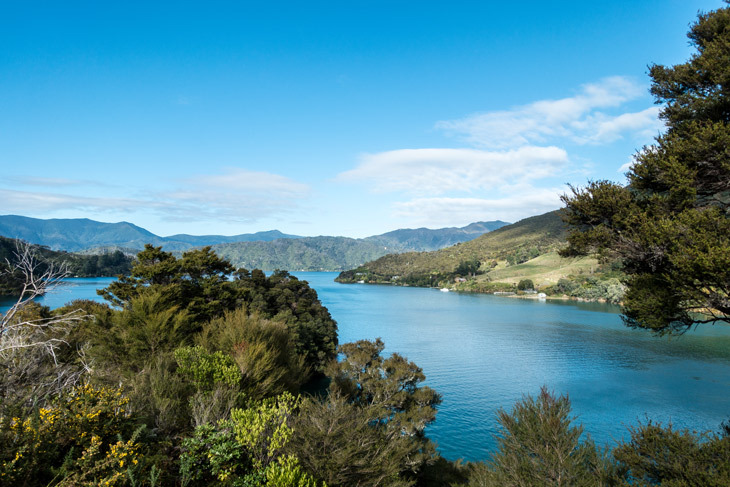 The landscape and forests haven’t changed much since Cook’s days, but Picton has now been discovered by the cruise ship industry: there are 30 cruise ship visits per year, and many locals would like to hold the line at that. Welcome to the world of the Great Gatsby. Napier’s most notable feature is its architecture, and they have made it a tourist attraction. Costumed guides lead tours about town, classic cars ply the streets, and 1930s Art Deco buildings are everywhere you turn. Following a devastating fire and earthquake in 1931, Napier city was completely rebuilt in the Art Deco architectural style of the time. 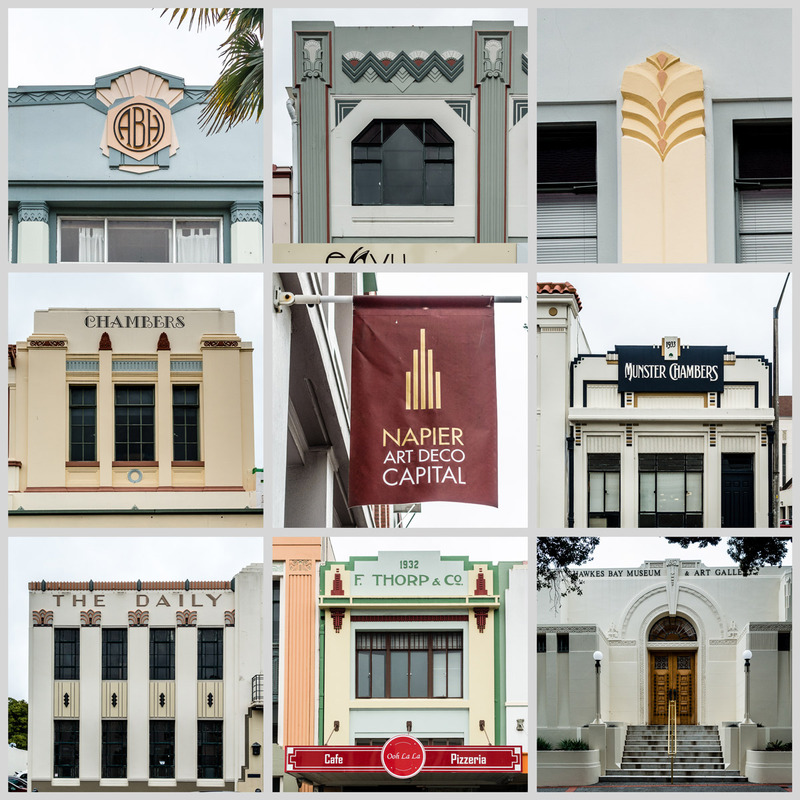 Of the original 164 buildings constructed, 140 still remain, making Napier one of the world’s largest concentrations of Art Deco buildings. Sunbursts and fountains, symbols of speed and flight, geometric shapes and ancient cultures are characteristic of the Art Deco style. The buildings and homes on Bluff Hill were the only ones to survive the earthquake, so they are Victoria-style. We climbed to the Bluff Hill lookout in an attempt to warm up. Brrr, it was cold! “Maybe in another life,” signed one crew member, when the Captain announced cancellation of our Tauranga port call due to high winds. For us the cancellation was not a big deal; we had planned to climb Mount Maunganui, a 232-metre summit on our nice-to-do list. For the crew, the disappointment was larger. For weeks they had been looking forward to a crew tour of the Hobbiton movie set. We aren’t great fans of Lord of the Rings and Hobbit movies, but we felt the crew’s pain. “Sorry, we can’t kayak today, folks,” said Zac, when we met him on the dock. We were dressed for paddling, dry bags in hand, but we weren’t surprised. It was wintry-cold and raining, winds were gale to storm-force, and the sea was covered with frothy whitecaps – unsafe conditions for getting out on the water. We had booked an exciting all-day kayak-hike called Rangitoto Island Summit, but that would have to wait for a future trip. Zac had a back-up plan: a sightseeing tour to Auckland’s rugged west coast, a part of New Zealand that even many locals have not seen. 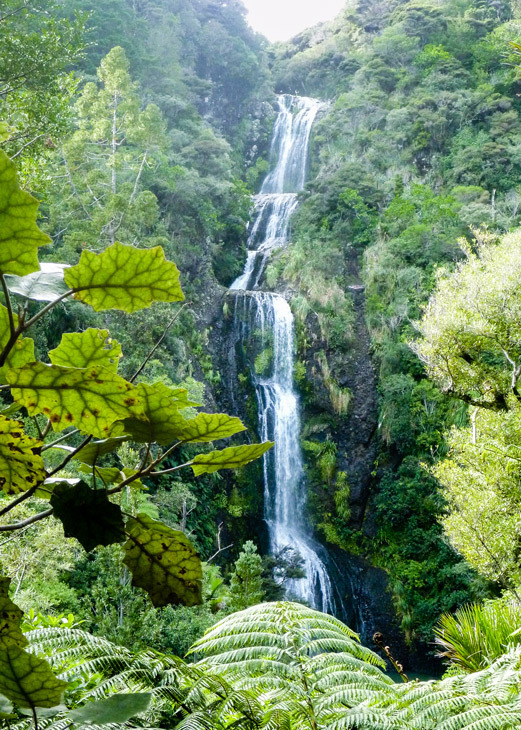 The scenic drive winds its way through Waitakere Ranges Regional Park, where a few stands of ancient tall timber survive amid dense bush of regenerated forest. Piha has three surf clubs and a coffee shop with surf board decor. It is sleepy on a wintry day, but we can imagine the buzz in warmer weather as Auckland surfer dudes fuel up for a hard day’s surfing. 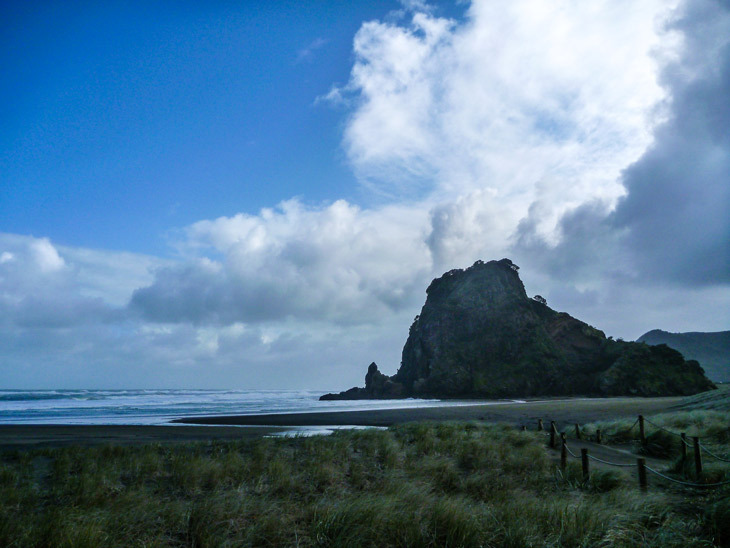 Although Piha is popular, it is also incredibly dangerous, with wild surf and strong currents; Zac tells us there is a reality TV show about the place, called Piha Rescue. Zac, who describes himself as sport crazy, helped us make the best of a stormy day. 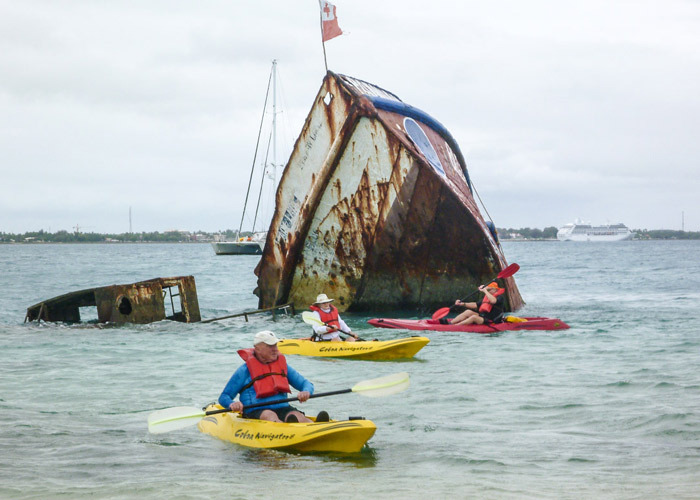 If you are coming to Auckland, check out his company’s day and overnight kayak tours. Encore! It was fun when we tried it three years ago, so we decided to do the Kayak Island Hop Adventure again. Vila, owner of Fatai Kayak Adventures, said we were her first repeat customers from a cruise ship. 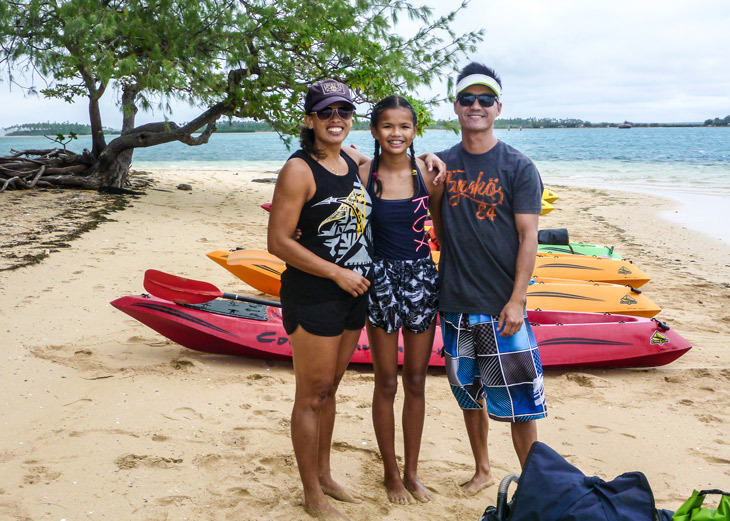 After apologizing for the weather, Vila, Tim, and their daughter helped our group into sit-atop kayaks and onto the water, with instructions to quarter the waves as we crossed one mile from Papiloa Beach to Pangaimotu Island. The Island boasts pocket beaches, coconut palms, mangroves that hold the island together, lots of sea shells, and a nearby shipwreck. We had two hours to explore the island, including time for lunch at Big Mama’s Yacht Club, before paddling back across to our starting point. This trip was all the more special because we were paddling with a group of friends – five other world cruise couples from our ship. So what if it was windy (20-knot crosswind), drizzly, and not exactly suntanning weather? Because we were with friends, and we got a bit of exercise, we rated this a perfect day. “Your shoes don’t look dirty enough,” said the national park ranger, sceptical that we had actually completed the World War II Heritage and the Blunts Point Trails. Our shirts and our faces were dripping with sweat, but our shoes were only moderately muddy, because we had stopped at a gas station to hose off the bulk of the sticky goo. We had definitely done the hike; now we wanted to ask about the toads. 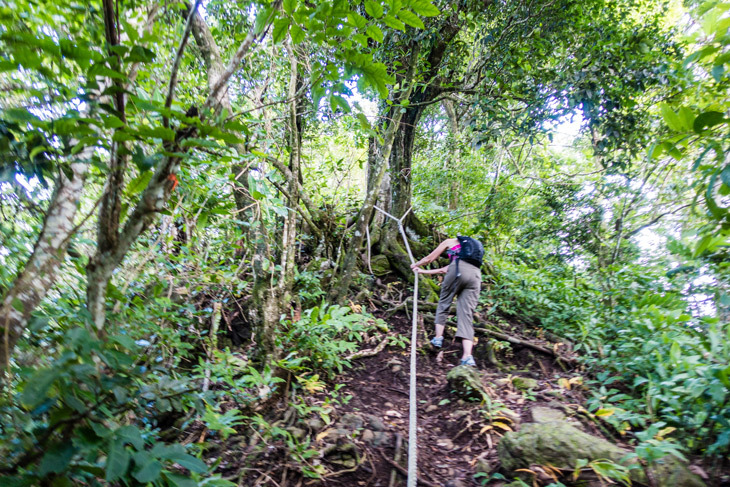 Our hike began with a steep, sweaty, rope-assisted climb through the tropical rainforest. One hour in the rain began, lubricating the clay trail. 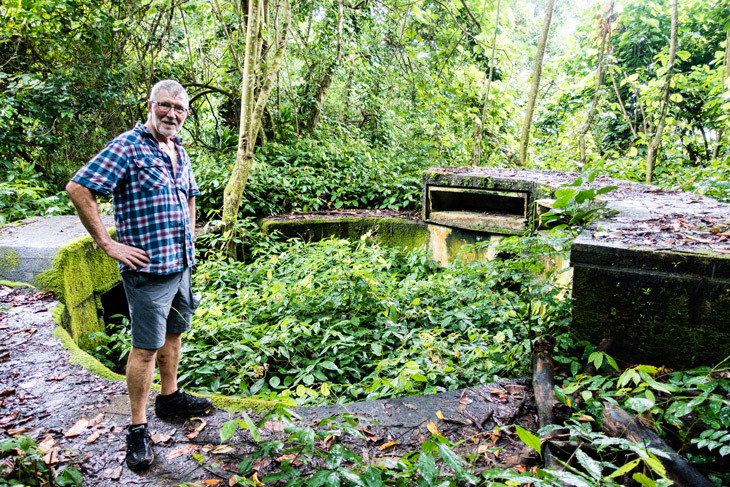 Next came a series of World War II gun emplacements which are gradually being swallowed by the jungle. 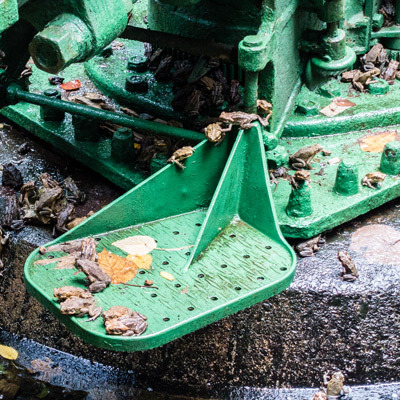 In a pool of water under one of the guns about 550 (we lost count) toads appeared to be trapped – a creepy sight. The park ranger said they weren’t actually trapped, but we aren’t convinced. Toads eat mosquitoes, you know. Should we have built a ramp to help the toads escape? Pago Pago Harbour, a collapsed volcanic caldera, is one of the largest natural harbours in the South Pacific. The town is surrounded by lush, green mountains, one of which is known as Rainmaker. Pago Pago still has much of the old South Seas atmosphere that captivated Somerset Maugham when he wrote his short story “Rain” in the 1920s. This place is remote and stunningly beautiful; bring an umbrella. 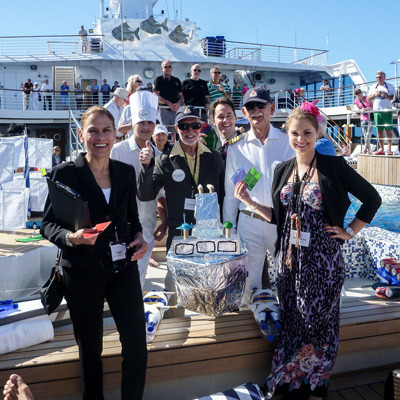 Doug’s team was runner-up in the Insignia Ship Design and Sea Trials contest, which took place in the Deck 9 swimming pool on May 27. Ten teams had one week to scrounge materials, design, and construct a vessel to be judged by the Captain and a team of officers with the following criteria: general appearance, creativity, seaworthiness, cargo capacity, and crowd response. Doug and his teammates didn’t win the bottle of champagne, but they each received a certificate signed by Insignia’s Captain certifying that they had created a seaworthy vessel (cargo carrying capacity: 24 Coke cans) while sailing the South Pacific Sea en route to Nuku’alofa, Tonga. The next day was Thursday, May 28. The day after that was Thursday, May 28 all over again, as we crossed the International Date Line. This entry was posted in American Samoa, Australia/New Zealand, Boats, Boots, Cruise, South Pacific, Tonga and tagged Auckland, Hiking, Napier, Nuku'alofa, Pago Pago, Picton. Bookmark the permalink.